No, this is not the painting I sold 40 years ago, but I have a story to tell, and I need an illustration! I am continuing my study of Andrew Wyeth’s drybrush and pencil techniques, and realized a few moments ago that this spring marks the 40th anniversary of my first significant art sale, at age 18. I was a senior at Northwest High School in House Springs, Missouri. I really want to tell my story. Throughout my four years in high school, I was competing seriously in student art competitions throughout the greater St. Louis area. 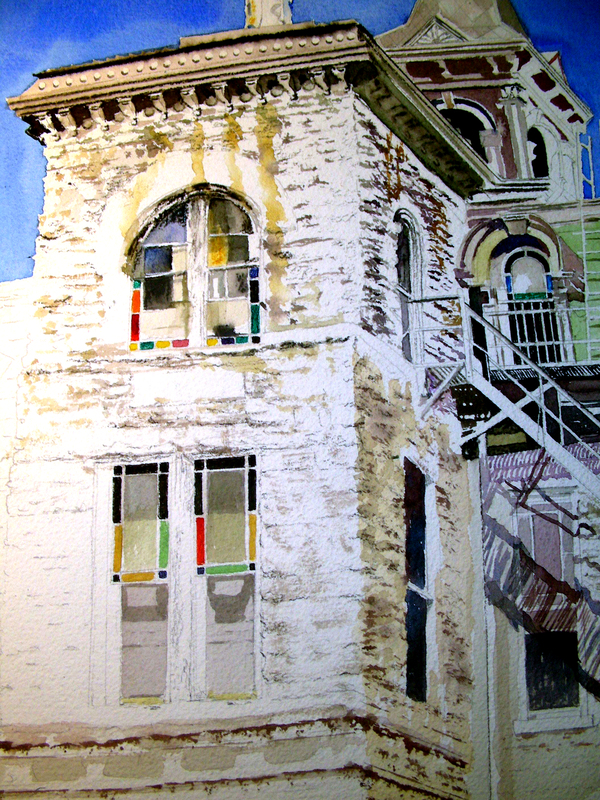 During my senior year, while at the Two Rivers Art Association competition in Fenton, Missouri, I noted with astonishment the framed and glassed drybrush watercolors submitted by an 18-year-old from north St. Louis. He was competing in the professional category, rather than the student. I managed to win the student competition, but he won the professional. His technique was a carbon copy of Andrew Wyeth. I could not believe my eyes as I surveyed every square inch of his barns, wagons, broken down houses, rendered in sepias, ochres and grays, with not a trace of green or brilliant hue of any kind. They were all fall and winter landscapes, and his dried-out weeds and foliage and stark naked trees just made me stare in wonder. How could an 18-year-old produce such sophisticated work? I encountered this young man’s work later that spring, further north, in the Warson Village Shopping Center. Again, he was competing with professionals, and again he won. And again, I stood before his work with an air of worship, overwhelmed at the understatement and sophistication of his pencil and dry brush technique. I did not own watercolors. But I took a piece of white mattboard, and diluted my Liquitex acrylics to apply as watercolor, and attempted my first Andrew Wyeth-style dry brush painting. The subject was the one posted above, only much cruder, of course. But I left the sky totally white, and all the foreground, save for dry brush stabbings of grass and gravel, white. 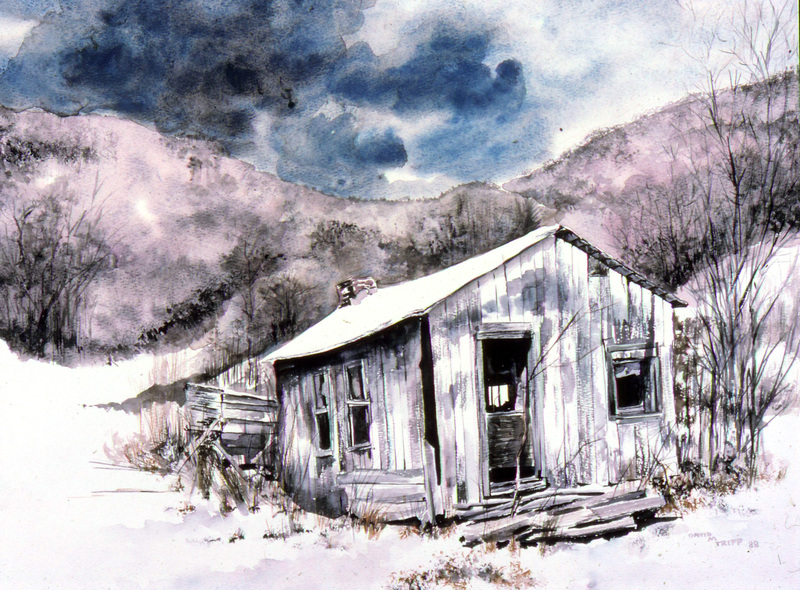 The old cabin was rendered in sepias and grays, and I worked plenty of graphite over the woodgrains of the worn-out siding. Once I finished, I knew I had something. The Andrew Wyeth signature was unmistakable, the large blank areas gave the composition a sense of remoteness, and I knew I was on to something better than before. Returning to school, I approached my art teacher, Mr. Elfrink, under whom I had studied since 8th grade. He was unloading the kiln in the suite between the two art classrooms. His back was to me as I entered the room and said: “I tried to do a watercolor over the weekend.” His response: “And?” I said nothing, but just held the painting up. He turned around, and his dark eyes immediately focused and flashed, and his entire countenance changed profoundly. Searching for words, he said something like: “Now that is . . . , it’s got . . . , it’s . . . that’s good.” That was all I needed. Forty years ago this spring. My first Andrew Wyeth-style painting sold. And now I’m still on his trail, studying his work for clues, trying to understand his magic, and hoping some of it will rub off on me. Sunday presented me with a bounteous gift. I received a surprise phone call while in the studio Saturday from a long-time teacher friend/colleague. Back in the early 1990’s we team-taught French Impressionism to her French classes and my art classes at Lamar High School. Though we had not seen much of each other for nearly two decades, we continued to share a common thread in French Impressionist art. She phoned Saturday to say she had just driven past a site in Athens, Texas that reminded her of Claude Monet’s gardens in Giverny–a pond on some private property that was glistening in the morning sun with a large body of water lilies. My friend contacted the owners and secured permission for us to go on to the property. I arrived the next day, and we went directly to work. 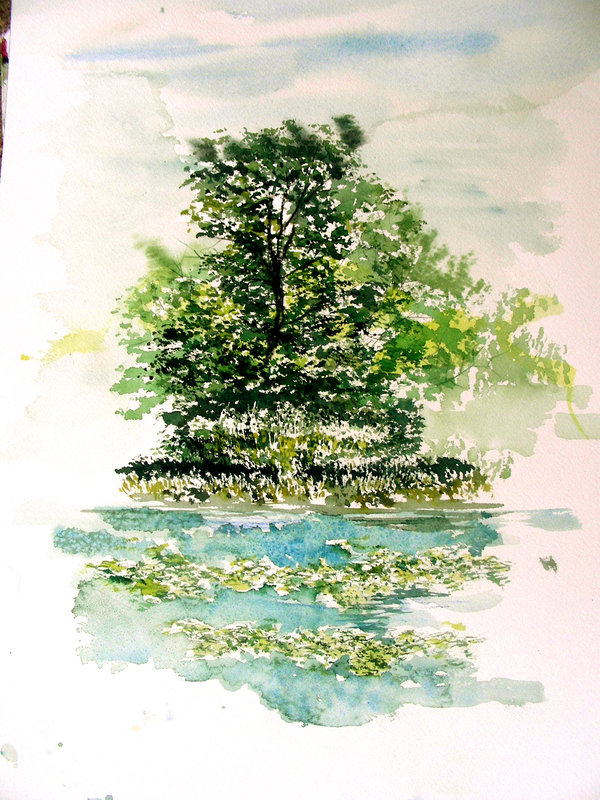 The owners of the property were extremely gracious to us, and I cannot recall a more splendid plein air opportunity than the one I experienced as the sun began to set on this beautiful body of water and lily pads. I was out of my element, which is always fun en plein air. I had never before attempted to paint lily pads, and found myself scrambling on this one. But the sight of the sun, back-lighting the trees behind the pond, proved just as scintillating a subject as the shimmering water surface itself, and I found myself getting lost in this composition. I have been invited to return when the lilies are in bloom, and I cannot wait for that day to happen. The two-hour drive was well worth the experience, and I welcome the return. I loved the connection I felt to Claude Monet as I studied the light playing across the water surface, the flickering leaves on the trees, and the bending grasses. I did not want to leave the site. I cannot thank my friends enough for giving me this opportunity. This is a blog that I began this morning, and then decided to “cook” throughout the day. I have had this habit of not editing my blogs, but rather posting them as rough drafts, and so by day’s end, I have ended up posting two or three of them. Today, I have chosen to experiment to see if I could send out a stronger blog at the end of the day, after it has had plenty of time for composting and editing. At the moment I am listening to Howlin’ Wolf’s “Spoonful.” I love spinning vinyl in my garage while working in the studio. And the Blues are serving me well as I work. I have declared today a study day, perhaps my first ever, deciding to keep the brush and pencil in the boxes for as long as possible, and spend my time instead researching Andrew Wyeth’s drybrush and pencil techniques, in an attempt to “solve” the conclusion to this Saint Ignatius painting. This is precisely the nature of Andrew Wyeth art that has held me since the ninth grade–that unfinished quality that allows white space to creep into the composition, and also allows the detailed renderings of his subject to fade into washes and sketchy lines as they move to the perimeter of the piece. I like the writer’s comparison of Wyeth drybrush compositions to a photograph “in the process of development.” My description of the experience has run along these lines: as we look at a subject, our focus is on a very small area, while everything on the perimeter moves out of focus and eventually leaves our field of vision altogether. That is how I myself have justified detailing the heart of my composition and letting the rest of it fade into a soft-focus effect, and eventually to white. In interviews, I have heard Wyeth declare that the strength of a composition depends not on what the artist puts in, but what s/he can leave out. As this article further points out, “most artists try to describe too much.” Ouch. I stand convicted. So, after repeated cups of coffee and wonderful Blues music played by Howlin’ Wolf, Muddy Waters, Albert Collins, Son House, Big Bill Broonzy and Robert Johnson, I got out the pencils, eraser and brushes and went to work, drawing and re-drawing the windows to the left of this composition, and some of the cut stones making up the wall. 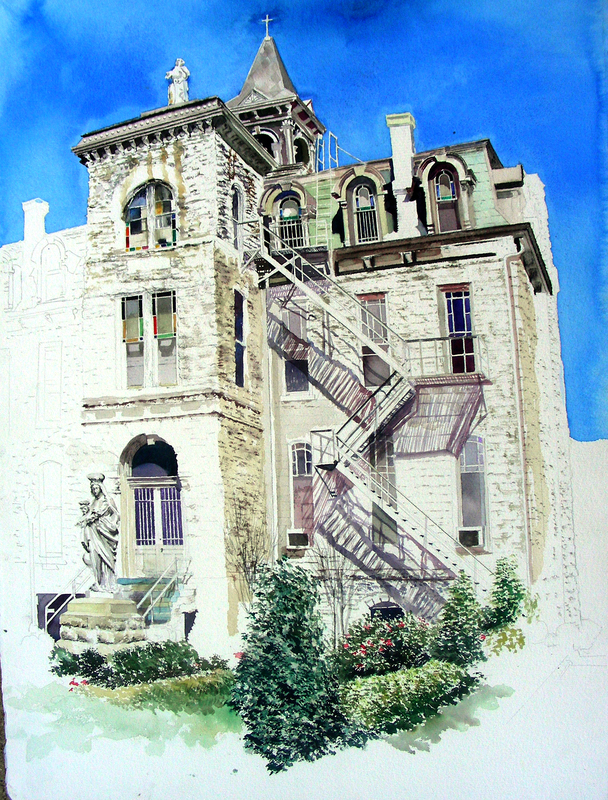 I laid in some light washes to suggest mansard roof color and rough-cut stone color. And I thoroughly enjoyed the fundamentals of drawing once again. It has been much too long. I have gotten away from the sketchbook and the core values of drawing for drawing’s sake. I like Andrew Wyeth’s fencing metaphor as he speaks of the sharpened pencil and the need to be decisive where you thrust the point of it, and how you move it across the surface of the picture plane. He’s right–it’s not for the timid. I have been timid too long. Thanks to a day with Wyeth, this large watercolor is becoming fun again, as I find my way back to the fundamentals of drawing. I wonder why I waited so long to return to the “graduate school” of art. This study has been very invigorating for me. I cannot wait to see what tomorrow holds. Good evening. Last evening I completed the monumental sculpture and base, and worked a little further on the portals, steps and handrails. Finally I splashed some wash on the lower left part of the foreground for balance. Then I got hung up. After consulting with a number of trusted artist friends, I’ve decided how to complete this. 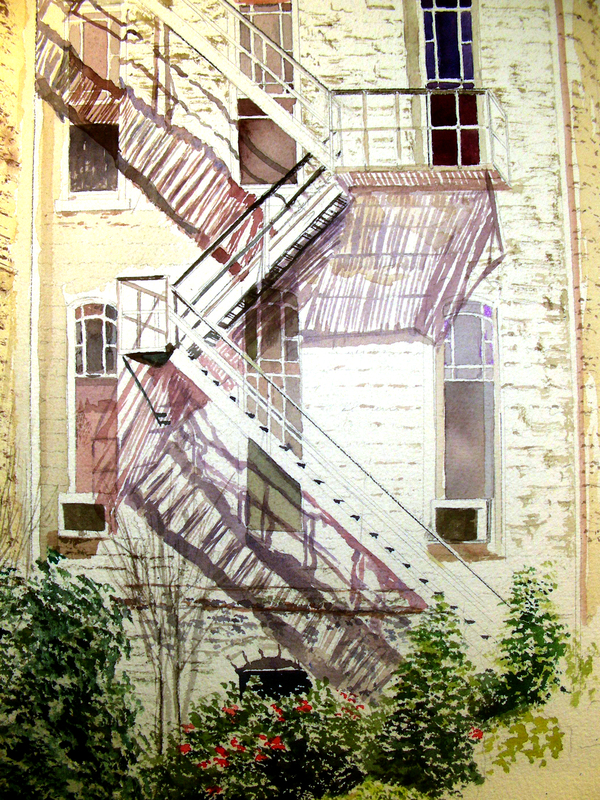 I will deepen the shadows on the receding walls, enrich some of the fire escape shadows, but most important of all, re-draw the architectural details on the perimeter of the composition. For that I need to go back and take another long look at Andrew Wyeth and his drybrush techniques. 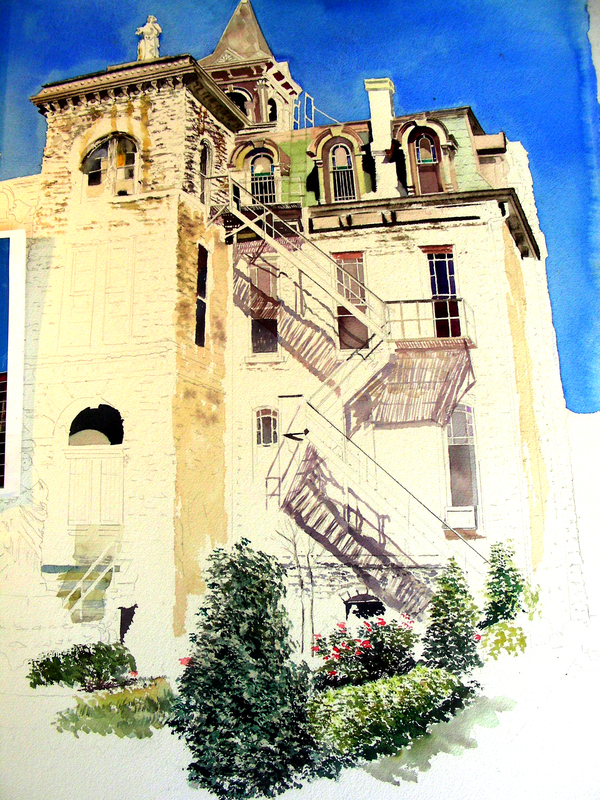 What I have always wished to accomplish in a major watercolor is to render in as much detail as possible the focal points of the composition, and then as the eye moves toward the perimeter, dissolve the picture into wash, and finally pencil rendering. I have always loved that dimension of Wyeth’s work. I’m going to spend a day or two “composting” this picture, the way our Venetian painter Titian did over 500 years ago, and Wyeth did in our last century. I’m borrowing that metaphor from Natalie Goldberg’s Writing Down the Bones. I am referring to a habit of Titian and Wyeth in their manner of gazing at their works for days near the end, determining what exactly had to be done to “finish” the piece. Goldberg, in the task of writing, speaks of how important it is for a writer to grow still, and allow thoughts to make their way to the surface, much in the same way that energy builds over time in a compost heap. All that is needed is time. And so I will give this picture time. I don’t want to lose it. I’m very, very excited about bringing it to closure, and right now have this burning desire to pore over the Wyeth work and glean ideas from his exquisite pencil renderings over watercolor. Thanks for reading. I hope the next time I publish this painting, that I present it to you as a fait accompli. You can mark out this week, as far as educating students in Texas goes. It is TAKS testing. Four hours a morning, our students are taking state standardized tests that are being phased out, and then our district runs the students through their regular classes throughout the afternoon for another four hours (30 minutes a class), assuming that they are getting further educated. In two weeks, we will wipe out another three days, with the new (and improved?) STAAR testing–same thing–test them all morning, then pretend to educate them further by forcing them through their abbreviated afternoon classes. Texas thinks it is educating students with all these standardized tests, when in reality the state continues its slide to the bottom of the nation with the SAT scores. Our state-mandated tests appear to have little-to-nothing to do with SAT success (when did they ever?). But tell that to our governor and legislature. They are the education experts. Just listen to our Texas governor speak publicly, and you know immediately what kind of premium he places on an educated mind. Teachers are allowed one day duty-free from the testing. This is my day. I will begin my fake classes at 12:15. 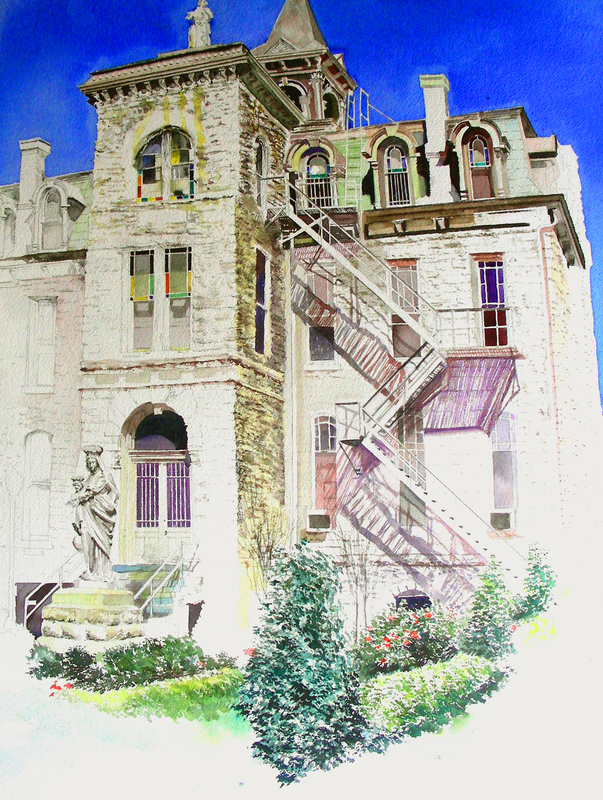 So, the morning has been spent in the watercolor studio, and I’m just about to finish the west portal of Saint Ignatius Academy. Looking at the remains of this bastion of education probably has me bemoaning the condition of Texas public education. The Jesuits knew how to train the intellect, and students passing through their corridors exited with trained minds. It still bugs me to watch our Republican-majority legislature and tax payers hold their noses when “public education” is brought up, while they look for every possible means to starve that beast, revenue-wise, and at the same time insist on higher standards. Makes sense, huh? After school today, I hope to begin work on this monumental sculpture just outside the Saint Ignatius portal. I have admired this monument, studying closely the photos I took, but kept procrastinating the rendering of it in watercolor, probably because I’m concerned about how to make her stand out against that facade background. But, I guess her time has now come. We’ll see what transpires this afternoon. I still have less than two hours to shower, dress, groom, fix lunch, and then head to school to pretend to accomplish something in each 30-minute class originally designed for 90 (I’ll have four of them in a row, in four different classrooms, on two floors, without a break–groan). But hey, at least the students got to take that phased-out TAKS test throughout the morning, so the day wasn’t a total waste, right? I believe this is the final year of TAKS testing before we move on to the new-and-improved STAAR standardized test. Bring it. Texas can brag all she wants about her state-mandated, standardized testing scores, but as long as this state remains the bottom-feeder of the nation with its SAT results, all that bragging will be nothing more than political showmanship. Our universities and corporations could not care less about Texas high school test scores. My musical company throughout the morning has been Neil Young’s “Live Rust” and Rare Earth’s “Get Ready” (both on vinyl). Great stuff to listen to while painting in the studio. And the weather this morning has been cool, the sunlight bright and clear, and the ambiance positively delicious. Well. It appears that it’s going to be another late night (my choice). I took a cat nap around 5:00, and once I rose and stretched my limbs, I knew what I wanted to do–return to the garage studio (where I’ve already spent the day) and pick up the brush again. This time I poured all my concentration into the fire escape, all the geometry, angles, irregularities of the rusticated exterior behind it, shadows–the works! And I have loved every minute of it. My companion this evening has been Son House. I have his legendary 1941-1942 recordings in chronological sequence on vinyl. Yesterday when my band played at J. Gilligan’s Pub, I found myself enjoying immensely a Keb’ Mo’ blues tune we hadn’t played in a couple of years–“Keep It Simple.” I have gotten away from playing acoustic blues on my guitar, and it was so fun to come back to it. So, Son House is flooding my soul this evening with good things as he hammers on his acoustic. I still have some art history to finish up for tomorrow, but I’m quite sure that I’ll return to the watercolor (or else read a book!). I don’t know why, but staring deeply into the facade of this bastion of Jesuit scholarship always makes me want to read theology! My volumes have been neglected recently. I have had an itch to re-study some of the theological trends that blistered between the World Wars (that’s where we are in A. P. art history right now). I believe this will be my last post tonight, even if I do continue working on the watercolor. The light in this garage has been fine for painting, but it’s giving me fits when I try to photograph this piece for blogging. Oh well, it’s 10:00, so I’ll say Good Night to you, and thanks always for reading me. Oooohhhh . . . I put on Howlin’ Wolf’s London Sessions and he’s now singing “Sittin’ on Top of the World.” That one always hurts. Hopefully, I’ll write you tomorrow! Good afternoon. Saturday came and went without watercolor pursuit. I was privileged to participate in a fundraising event at J. Gilligan’s Pub in Arlington. I donated a limited edition print for a silent auction, and my band played a short gig. That pretty much wiped out my Saturday. Today, however, I got to spend most of the time in the garage studio. I worked on A. P. Art History for quite a few hours, re-arranged my studio, then redirected my energies toward this full-size watercolor. I worked all over the composition, so I cannot isolate a small area for detailed analysis. 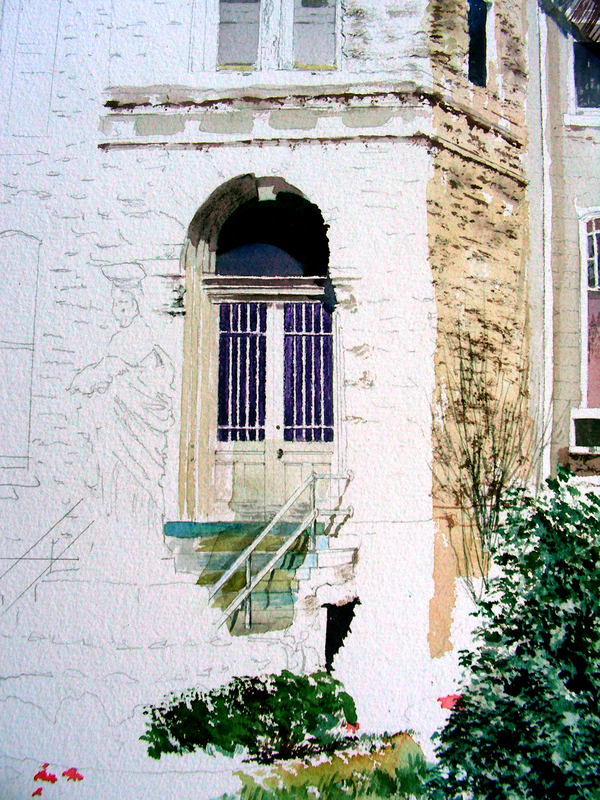 Today I did windows, foliage, fire escape, rusticated stone work and various assorted details. The painting is starting to tighten up in detail, and it’s time for me to make some compositional decisions before it gets out of hand. I’m starting to get lost in it again. I’ve decided to walk away from it for a few hours, and just may return to it tonight. If I do, then I’ll probably post a blog once more before bedtime. My companions today (besides my watercolor buddy and bandmate David Slight) have been Albert Collins and Robert Johnson. Again, Blues make fro great companionship in the watercolor studio. It’s been another busy weekend. 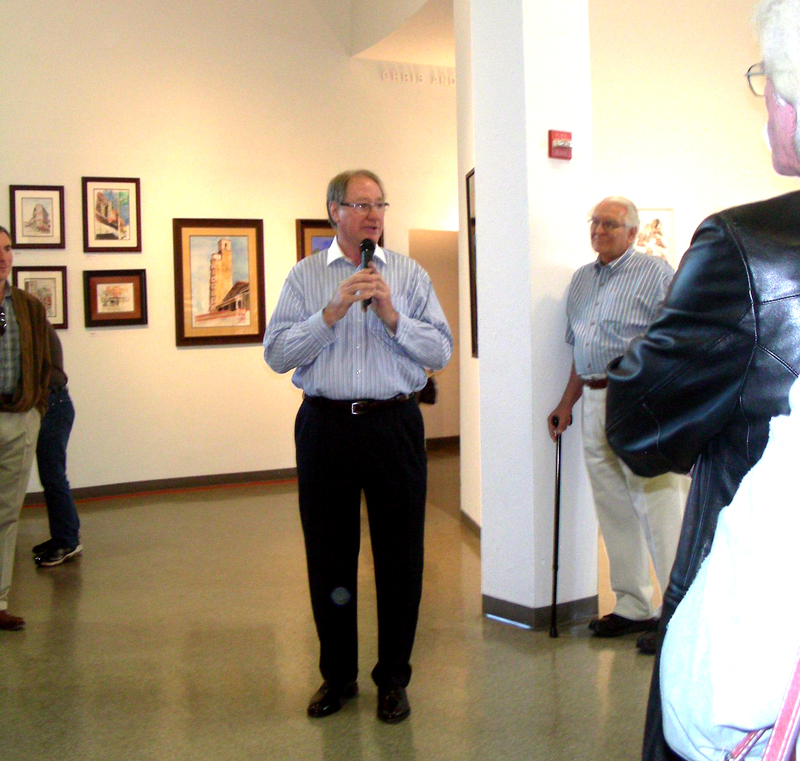 Friday was my birthday, and how wonderful it was to open my first museum show that night. The Arlington Museum of Art curated a 5-member show titled “5 x 5” and I was delighted to be a part of it. What I didn’t know was that the artists would be called on to address the audience, discussing their art and entertaining questions. I was glad to be at the end of the alphabet so I could have time to think of what to say when my number was called. My art business is a sole proprietorship that I call Recollections 54, my birth year (and today my birthday!). What I attempt to do in watercolor is capture the remnants of a 1950’s America that is dying from our landscape as more and more architectural structures are marked for demolition to prepare for tomorrow’s progress. Though these landmarks are fading from our landscape, they will not fade from our memories. When we stand in the presence of these sere remains, we often are overwhelmed with a dual sense of loss and presence–loss because we note that the business or residence is no longer “alive”, presence because if we linger long enough, we feel the connection, the shock of recognition, realizing that it is our own past we connect to as we stand in the presence. Marcel Proust reminds us that we feel warm primal memories with gratitude when sights like this stir up our childhood recollections. My only hope is that viewers can feel some of what I feel when I see these sights and attempt to reproduce them in watercolor compositions. Thanks for reading. I am at http://www.recollections54.com. This morning had a rocky beginning. Thunderstorms blew in around 4:00 a.m., disturbing what was already a restless night’s sleep. I’ve had too many of those lately. I rose, went through the morning rituals mindlessly, and honestly forgot that today is my birthday. I had been aware of it all week, and had already received cards, but was just too brain dead to think about it in this morning’s darkness. I stumbled into my classroom at 6:50, flipped on the lights, and saw this. I never saw it coming. I broke down and cried, and am glad no one came into the room for the next ten minutes or so. I could not take it all in. 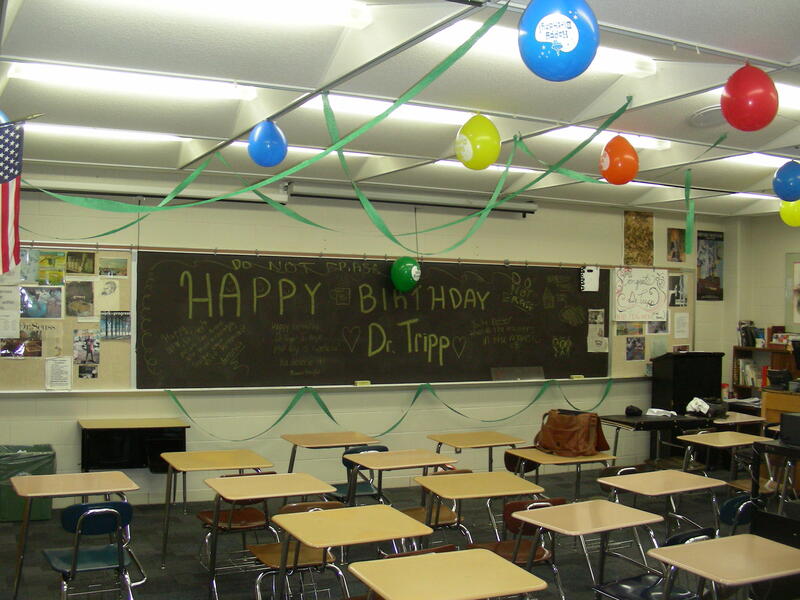 I had been ambushed like this a few months ago, when I found balloons hanging everywhere and sweet sentiments all over my blackboard for being chosen as NHS Teacher of the Month. I never took those balloons down, so they became rather soft and limp over time, and I thought they really needed to come down, as they were growing unsightly. But I wanted to hold on to that memory, so they saggingly remained. So, imagine my surprise this morning when I flipped on the lights, and noticed that the balloons were full again, and there were new streamers! It was just too much. It still is. When you turn 58, you get to a point that you feel that you no longer matter, and teaching in a large school is good for that kind of anonymity. You just show up and do what you have to do, and when you face an administrative year as bad as this one has been, you spend a lot of time sucking it up, and wishing you had started your career earlier so you could just retire and get this over with. And then students do something like this behind your back. For two decades, I’ve heard common talk that students in large suburban schools are thoughtless, full of themselves, and disrespectful of authority. Sure, there is some of that, I won’t argue. But I wouldn’t have exchanged yesterday’s Art Club tour group for anyone. I was proud of them in the museum, and even more proud in the crowded restaurant at lunch–one could not have asked for better, more respectful, enjoyable human beings. And that also rings true for most of the students in my classes. I was stunned, reading all the sentiments on the board, and noticing that some of them were from former students that I have not seen in the classroom this semester. And then the Birthday Card, including a signature from a student who graduated in ’07. Wow. Today’s Facebook greetings have also been overwhelming–my BlackBerry has vibrated on my hip all morning! For years, my daily companions that flood my soul with inspiration are those who have already passed–Paul Tillich, Edward Hopper, Andrew Wyeth, Ralph Waldo Emerson, Eugene Delacroix–they are not dead to me, they still whisper in my ear those immortal thoughts that keep me believing, keep me going forward. But today, my students and friends have embraced me and flooded my soul with good will. And I cannot thank all of you enough.